Global Denomination = "Global Discipline"? form, GBHEM’s BOM Mid Quad Event. (my brain hurts after writing that statement because of all the UMC Polity involved) It was interesting, most of the time, and I felt like I was the little kid invited to the adult table at Thanksgiving. The last session was on Friday and it stood out to me as one of the more interesting sessions of the event. In this session there was discussion from a panel of people working on formulating a Global Discipline. This proposal will come up at General Conference 2016 (GC). Here is my basic understanding of the work this panel was doing. They were tasked at another GC to see if a Global Discipline could be formulated. They were to go through the current Book of Discipline and boil it down to the basic essentials which makes the United Methodist Church the United Methodist Church. The point of a Global Discipline would mean that the essentials of what makes a UM church can be held up around the world. Yet how the local churches/regions then are ruled, governed and so forth are left up to those areas. Here is a quick example. The Trust Clause is essential the UMC in America because the denomination holds the deeds to all property and makes us, or forces us to be connected. Yet not all countries allow a denomination to ‘own’ property. So how does a UM Church exist in a European country that doesn’t allow it to own property? Clergy educational requirements are another example. How can we hold other clergy to the same educational requirements as we do for US clergy when they may not have access to that type of education? Do we stop ordaining people in Africa or parts of Asia because they don’t hold a Batchelor’s degree and Masters of Divinity because the nearest place to get that type of education is a continent away? These are quick illustrations of the problem that is uniquely United Methodist. Something I found truly inspiring is this statement, “The United Methodist Church is the only denomination attempting to make a global church with democratic polity.” No other denomination in world is attempting to do this. Sure the Roman Catholics have a global denomination but it isn’t run democratically. Other denominations may run their synod, conference, or convention in a democratic fashion but they aren’t global. They are truly only regional and may only have churches in one hemisphere of the world. The UMC is truly a global denomination that is trying to figure out how to order, run, and grow that denomination in a global society. 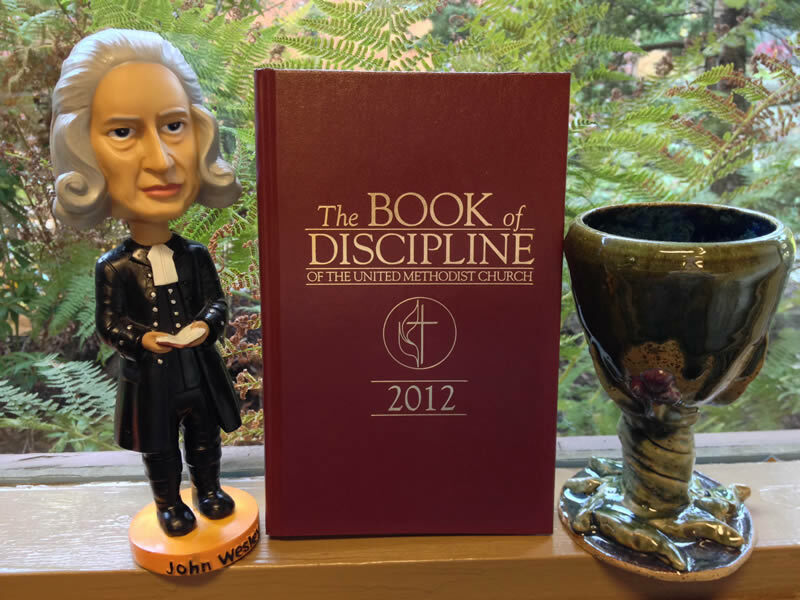 Our current Book of Discipline is centered on how to run the UMC in the US. The polity of District Superintendents and the local churches are focused how we do things in America. The idea of a Global Discipline would free up local churches in the central conference to figure out how to be the best UMC in their part of the world. One concern our table had (during our discussions) is that this would seem like a ploy from the liberal movements to get rid of the African vote at General Conference and push more inclusive stance on homosexuality within the America’s UMC. This cannot be further from the truth. The idea of a Global Discipline has come from the central conference, those churches outside the US. They want more freedom to in order to organize their local churches with what makes sense for their part of the world. Now there was no discussion on how parts of the homosexuality debate would fall within the Global Discipline, such as the ordination or marring of homosexuals. I guarantee this will come up at GC2016. My personal reflection on the matter is that it just makes sense. For us in the US (who yes financially support a dramatic chunk of the central conference) to dictate how the rest of the world should govern the local churches seems a lot like colonialism. It makes sense to have one Discipline that states this is what it means to be United Methodist as a standard for all UMC and call it a Global Discipline. It also makes sense that how the governing of the church, the local polity, then be left to decided by that area of the world. The more you think about it the more questions come up, I know. What are your thoughts? Could a Global Discipline work? Then there would be regional disciplines; Volume 2 Disciplines, that would dictate the local/regional/national polity involved, would that work? The bottom line is we are attempting to do something that is not currently nor ever been done before. We are bridging, building, and growing a global denomination run by democratic polity. We are unique and we should take pride in this fact. We should also recognize that if we want to succeed at this task, then it will take changes to our sacred Book of Discipline. Please do Cynthia, it is perfectly ok.